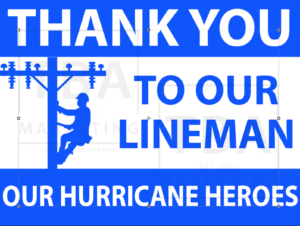 In efforts to show thank you to the real Hurricane Heroes who will never get enough credit for their 16+ hour days, we decided to design up and order some coroplast yard signs (with stakes) and stickers. 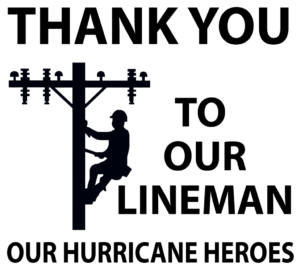 The proceeds from the sales will go directly to FINS – Friends in Need Services, to help locals that are in need due to damage from the storm. Let’s get a sign in every yard and a sticker on every car possible!